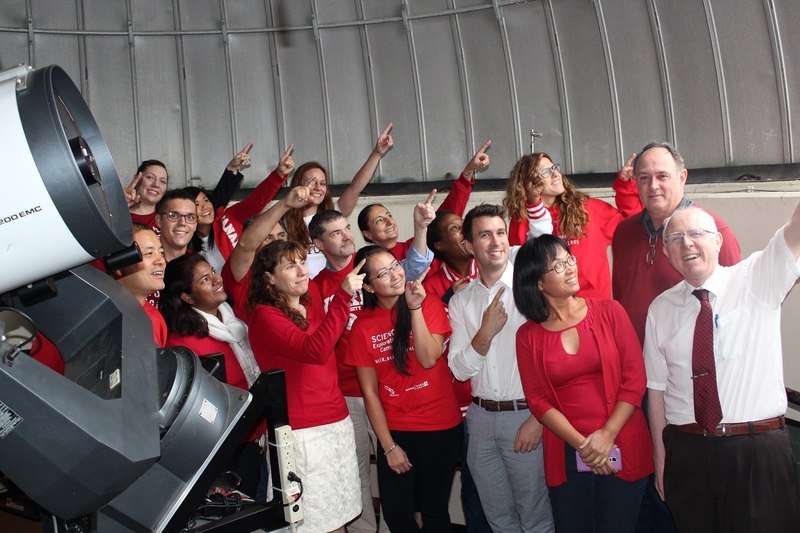 Faculty of Science staff won York University’s #YUSpirit #YUImpact Red and White Day photo contest. 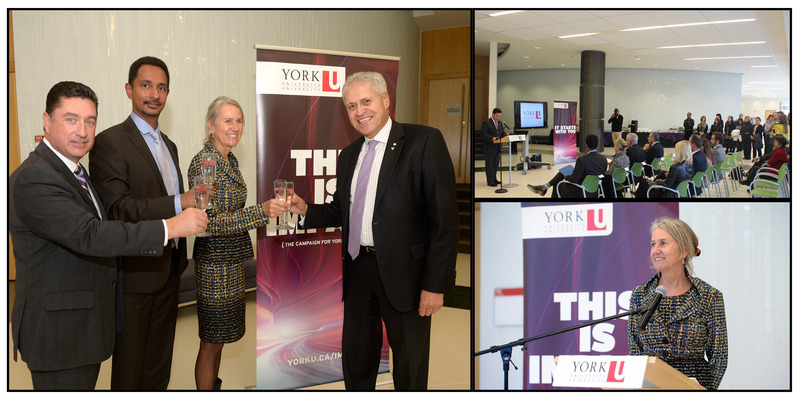 Alumna and CAMH CEO Catherine Zahn on receiving the Bryden Alumni Award for outstanding achievement from York University. Jean-Paul Paluzzi (Biology) on receiving the 2016 Petro-Canada Young Innovator Award. Laurence Packer (Biology), who received a grant from National Geographic to conduct biogeographic research on Southern South American bees. For the second year in a row, Maclean’s has named a Natural Science course as a “Cool Course” at York. This year it is NATS 1880, “Life Beyond Earth,” taught by Paul Delaney and Michael DeRobertis (Physics & Astronomy). Laurence Packer (Biology) participated in a panel discussion on biodiversity and sustainability hosted by the David Suzuki Foundation. YFile covered the public health workshop held by the Pandemic Influenza Outbreak Research Modelling (Pan-InfORM) team, chaired by Seyed Moghadas (Mathematics & Statistics). YFile published a Halloween feature on werewolves featuring work by Derek Wilson (Chemistry) and Jane Heffernan (Mathematics and Statistics). 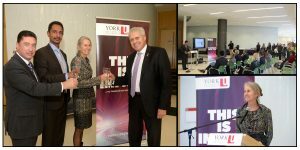 Along with John Dupuis (Steacie Library) and Marisa Sterling (Lassonde), Dawn Bazely (Biology) co-organized York University’s Ada Lovelace Day annual lecture and Wikipedia editathon. The lecture, “Gender, Equity and Inclusion: a Cosmic Perspective,” presented by Professor Bryan Gaensler from the University of Toronto, is now posted on York Science’s YouTube channel. Dawn Bazely (Biology) and John Dupuis (Steacie) were featured in Science Borealis’ 100 Voices for Canadian Science Communication series. Kenton Kroker (Science & Technology Studies) co-edited the spring 2016 volume of the Canadian Bulletin of Medical History. Emeritus Professor Abe Shenitzer (Mathematics and Statistics) translated a memoir of Hugo Steinhaus, A Mathematician for all Seasons. The publication was co-edited by Emeritus Professor Robert Burns (Mathematics and Statistics). Walter Whiteley (Mathematics and Statistics) co-authored three chapters for the 3rd Edition of the Handbook of Discrete and Computational Geometry. Two of the chapters were also co-authored by his former PhD student Bernd Schulze (Mathematics and Statistics), who is now a Lecturer in Mathematics at Lancaster University. Walter Tholen (Mathematics and Statistics) was on a two-week visit at the Institut de Recherche en Mathématique et Physique at Université Catholique de Louvain (Belgium), pursuing joint research projects and presenting a talk. Co-led by Jianhong Wu (Mathematics and Statistics), the research found that the dengue vaccine can increase to Zika outbreaks. Jane Heffernan (Mathematics and Statistics) was on Global TV to talk about a new math modelling study on NHL fandom. Sapna Sharma (Biology) participated in a panel discussion on the impact of climate change on the Great Lakes on TVO’s The Agenda with Steve Paikin. ScienceNode, a publication funded by CERN and the National Science Foundation, reported on findings by Sapna Sharma (Biology) and her former Master’s student Thomas Van Zuiden on invasive species and climate change in Ontario lakes. Van Zuiden also spoke to the Outdoor Journal Radio Show on Sportsnet 590 THE FAN about this research. Vice Motherboard covered new research by Dean Ray Jayawardhana and his team, including Master’s student Keavin Moore, on the future of tatooine worlds orbiting binary stars. Dean Ray Jayawardhana and the York Observatory were featured in a program about Mars on CBC Radio’s Ideas. Former PhD student Scott McIver (supervised by Laurence Packer, Biology) and his graduate work at York University are highlighted in Science Line. Dawn Bazely (Biology) explained the science behind why leaves change colour during fall for an article in Metro News. Paul Delaney (Physics & Astronomy) spoke to CTV News about President Obama’s pitch for a mission to Mars, the Shenzhou 11 launch and the ExoMars Schiaperelli landing. He also spoke to SiriusXM and AM900 CHML about these events. Nov 7: Final lecture of The Fascinating (and Sometimes Scary) World of Infectious Diseases series, presented by Gerald Audette (Chemistry). 7pm, Barbara Frum branch of the Toronto Public Library. Dec 7: Media Workshop for Researchers, hosted by the Faculty of Science. 10 am -1 pm. Location and details TBA.